Opportunity for a unique and discerning buyer looking to put their personality and creativity into this exclusive home. 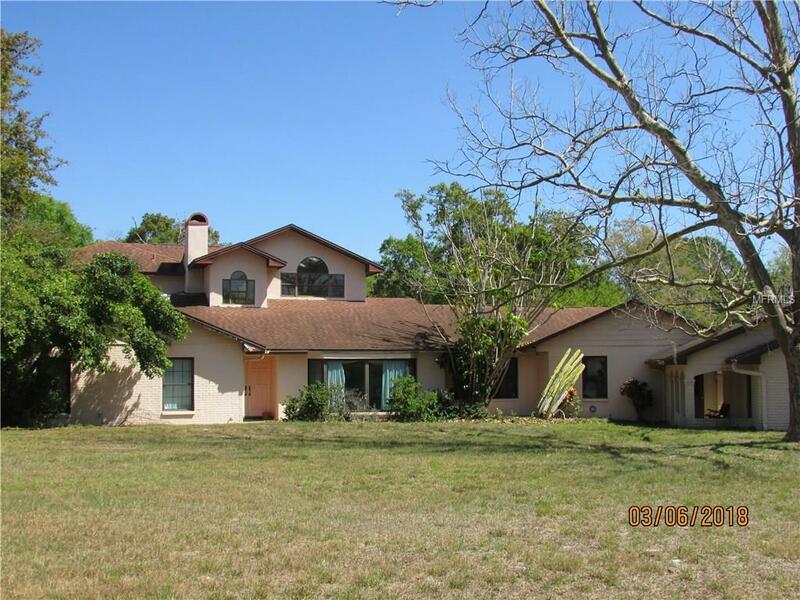 Over 4000 square feet of living space located on 1.2 acre wooded lot backing on to Curlew Creek in Dunedin. Spanish Trails subdivision is a secure, quiet area of luxury homes and unique properties. This home features 4 BRs, 3 baths, a 3 car attached garage plus a 2 car detached garage, and a private pool. For casual and elegant entertaining it has a formal Dining Room, formal Living Room, Island Kitchen and wood burning fireplace for those few chilly nights. A spiral staircase, illuminated with ceiling skylights leads to the huge second floor games room/office/study that overlooks the great room and has an outdoor balcony with a view of the wooded creek. Textured surfaces abound with wood, glass, stone, and brick features throughout. Master bedroom has his and her bathrooms, dual vanities and soaker tub. The MBR sitting area has patio doors to the rear yard. The laundry room and walk in pantry off the kitchen make chores a breeze. The island kitchen with built in appliances, overhead exhaust and breakfast bar are ideal for family meals. The enclosed lanai off the kitchen overlooks the rear yard and pool area for casual days or relaxing nights. Plenty of room in the back yard for bar-b-ques, entertaining and pool parties. This home is priced to reflect the need for repairs by a buyer with vision who is willing to restore this grand home to its former splendor.